So I have this wonderful tendency to talk to random strangers any place I go - and I am particularly bad (according to the husband) at doing this in the grocery store. I dunno - I have this thing that there are so many of us out there doing our own thing, in our own world just ignoring everyone else we walk by. Now don't get me wrong there are plenty of times that I've walked through the grocery store with my headphones on trying to ignore the world. However, there is an equal number of times when I'm confused or looking for something and I wish that the person who swoops in past me, knows what they are doing would stop and say "Hey you look confused - need anything" or something along those lines. I have done it in the past and will likely continue to do it (e.g. finding people trying to figure out how to make butter chicken, or looking for the stock cubes and pointing out the two places you can find them in the store and that one is in fact cheaper <- you can often find them in the ethnic food aisles for a lot less and trust me it is the same thing this also applies to spices but now I'm getting side tracked). My inspiration for this dish originally came again from Gordon Ramsay's Ultimate home cooking course and then from his cookbook. However, when I was in the produce section checking out ginger and debating if I was going to get some - and I was frustrated because the store didn't have cilantro. 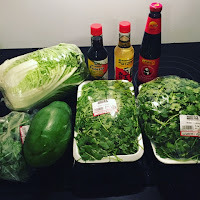 Enter this amazing woman who started talking to me about the cilantro and highly recommended that I tried the chines food store in the city for a lot of the staples and produce as they tend to be cheaper and fresher because of the high turn over in the products. She also gave me two recipes which even now I'm trying to remember as they sounded delicious! In any event I did end up going to Young's in the city and the food and stuff they had there as amazing! The prices were also unbelievable! The two large trays (heaping trays) of cilantro in the top picture were $2 each and had nearly a pound of cilantro. A huge bag of mint was under $2 and so fresh. 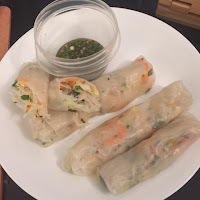 After I contained myself with excitement I knew exactly what I wanted to try making when I got home - the Fresh Shrimp Rolls - and let me tell you they are amaze balls! The first night I may have been working on them late into the evening and I may or may not have had some hard lemonade ...(did) so rolling was not happening for me - plus the directions in the book was like "oh, just roll like spring rolls..." and I literally looked at the book and said - "like that helps only if you know how to make spring rolls...."
In any event it still tasted amazing. 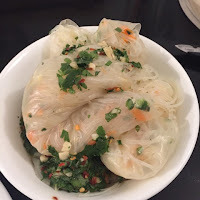 The husband wasn't keen (he has issues with textures of food) but as a unwilling victim participant he tasted them and was blown away. OMG SOOO good! The next night I went back and watched the original video then tried rolling again. They aren't as tight as they probably should be but I am going to say they get a passing grade!